Crumbled blue cheese, ginger-orange vinaigrette and candied walnuts. The sweetness of the apple, vinaigrette, and candied walnuts balance well with the blue cheese. Even though there isn’t a lot of it, the cheese sure does pack a punch. The beets were soft and provided a unique touch. This is an excellent salad choice! 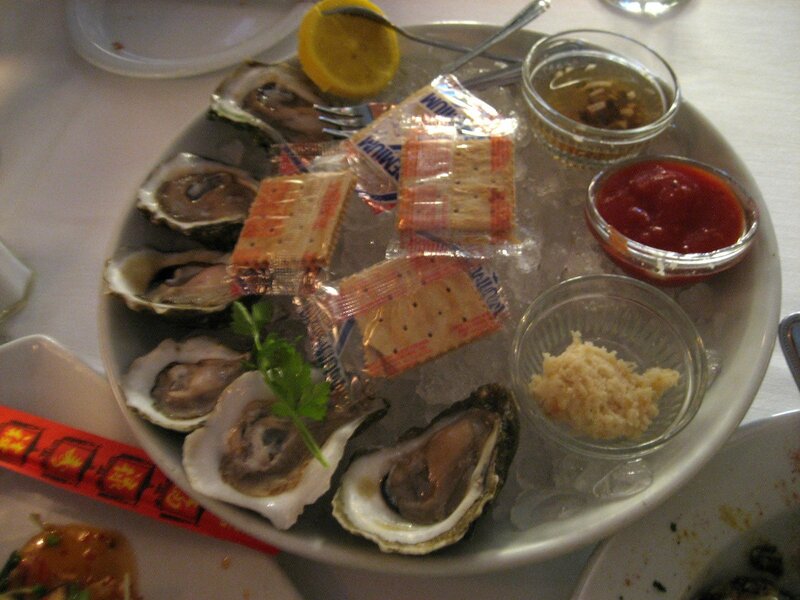 These oysters on the half shell came out on a bed of ice. They were very fresh and came with some crackers and a few other condiments. 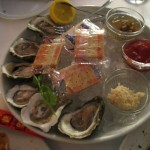 These were not little oysters either – they had a good amount of meat in each shell! They are available for 75 cents during happy hour – what a great deal! You can order them by the dozen or half dozen. Nicely flavored pieces and some of them packed a pinch of heat too. They were fried well and gave a generous amount too. Some pieces were a bit soggy because there was a lot happening on the plate. 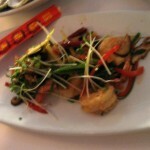 This dish was a bit small and didn’t have too many shrimp, even for the happy hour price. 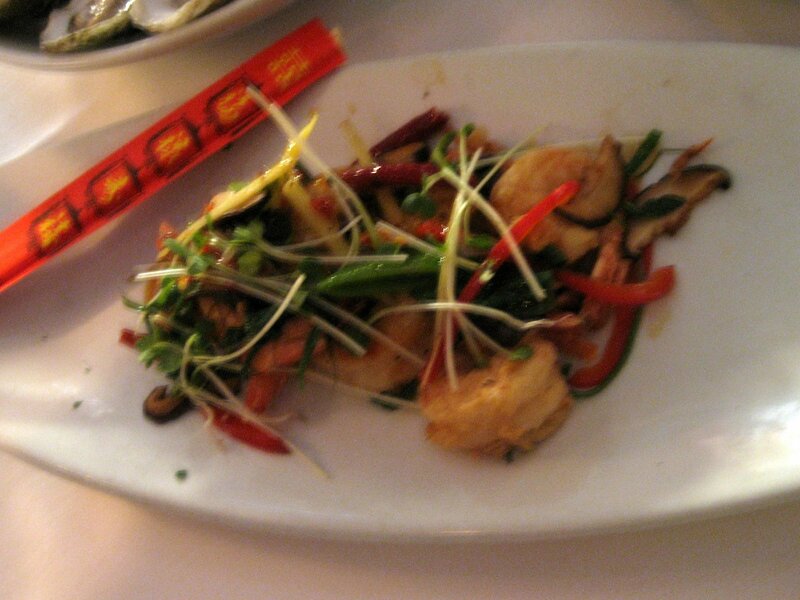 The shrimp had a nice mild flavor and so did the surrounding vegetables. The shrimp was somewhat chewy though, probably from being a tad overcooked. Also, what we thought were thinly sliced bell peppers were actually hot peppers – so watch out for them! Although a little skimpy, the thinly cut Ahi Tuna was delicious. Very smooth and tasted fresh. We’d order several of these because you won’t want to share! 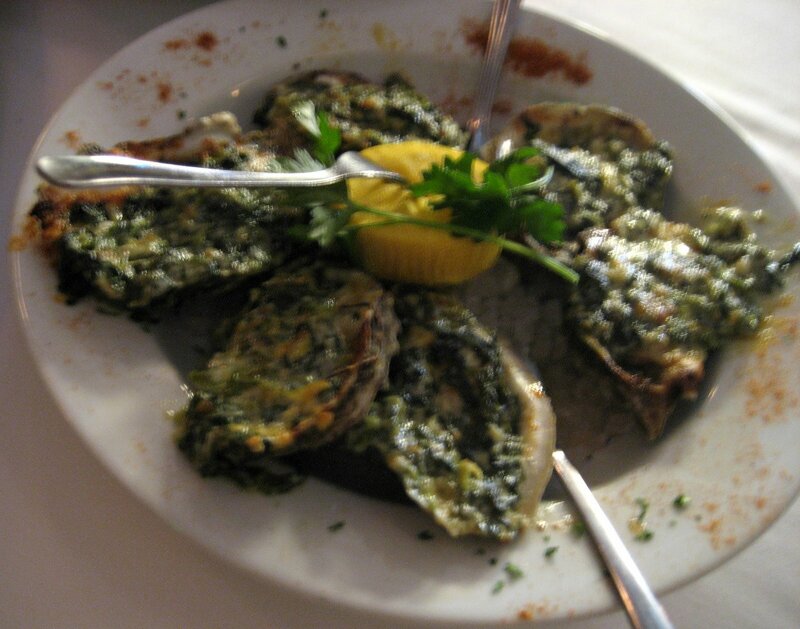 This is a good option for someone who is afraid of trying oysters because you won’t really taste the oyster at all. It tastes just like spinach artichoke dip – the kind you usually eat with chips. Oyster fans may be disappointed since the actual oyster gets lost. The flavor of the spinach and artichoke is delicious though. 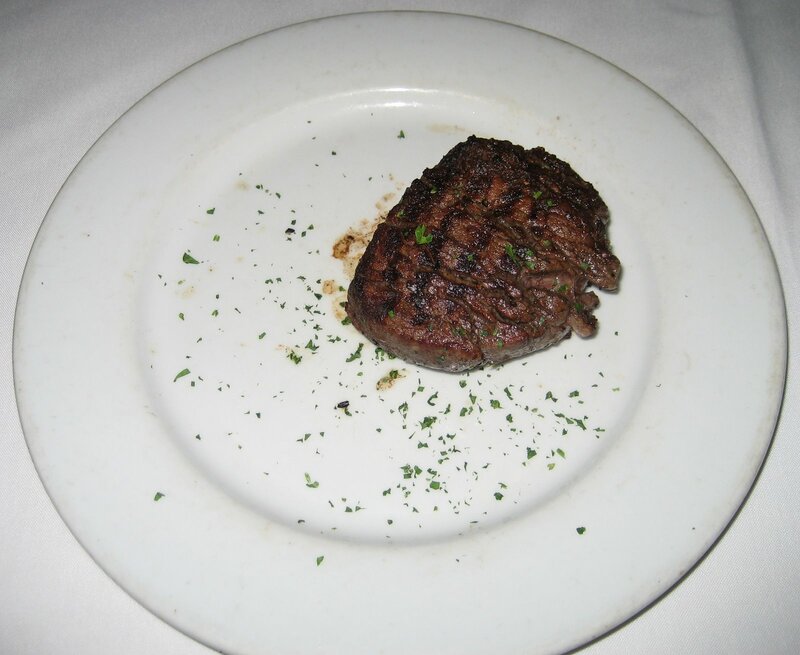 Many people rave about the filet here so we had to give it a try to see if it lives up to the hype. When the waiter brought the dish to our table, he actually waited for us to cut it open to ensure it is cooked to our liking. We thought this was a nice touch, rather than trying to flag him down if there was a problem. Well, it is a good thing they were there because we were shocked when we sliced it down the center. Although we ordered it medium, the inside was RAW! I’m not talking pink or red, it was as if the cow was still alive. The waiter was shocked as well, apologized and replaced it with a new one within a couple minutes. The second one was cooked to perfection – the outside was charred and full of flavor. The meat was extremely tender and juicy. We should have ordered the 12 oz because the 8 oz just wasn’t enough to satisfy us. Wow, we will definitely be back to try this one again! 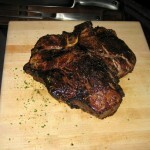 One of the specials that night was a 42 oz porterhouse – that isn’t a typo and yes, we were crazy enough to order it. The waiter brought out this mammoth piece of meat on wooden carving board with a case of carving knives. Since this was an off the menu special, we thought that table-side carving added to the experience. 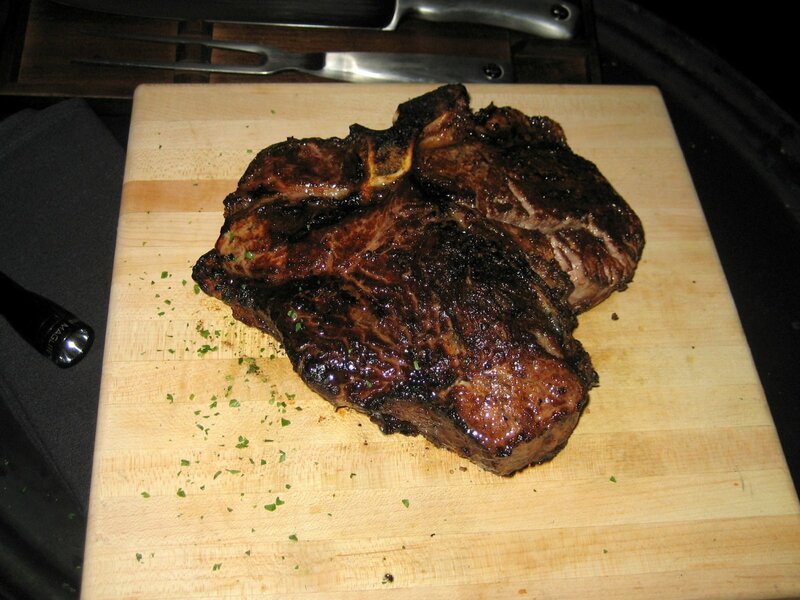 The tenderloin portion of the porterhouse was just like the filet – soft like butter. The short loin portion was also quite tender and had a pinch more flavor than the tenderloin. This steak was cooked just right and was definitely one-of-a-kind. 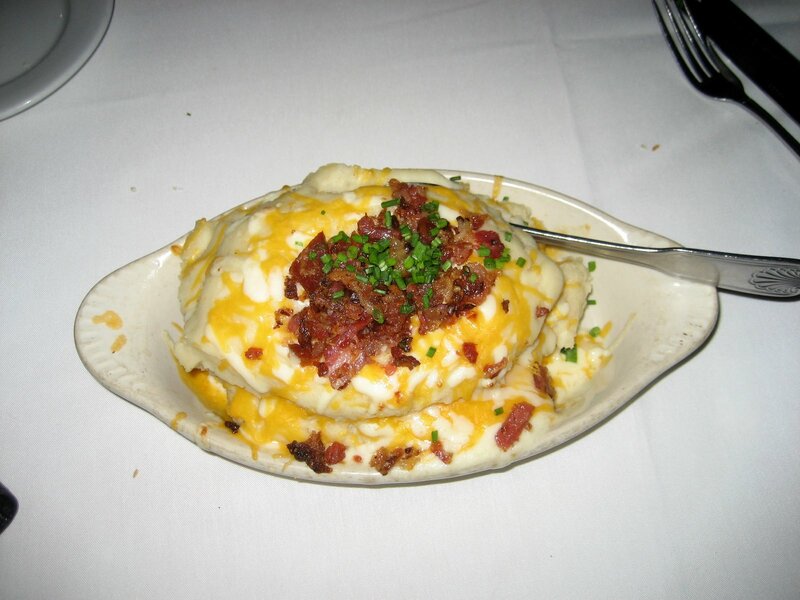 Baked potato with cheese and bacon. This colossal side-dish can easily be shared among several people. 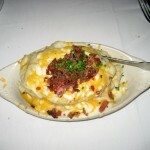 The potato itself was like plain mashed potatoes, but the bites with bacon in them were more flavorful. 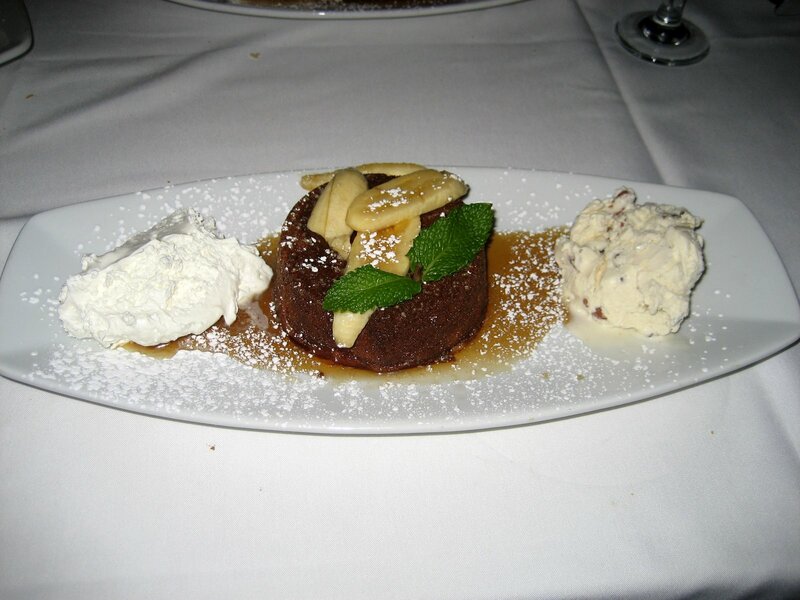 This highly recommended dessert t is a specialty of Eddie V’s. The dish is flambéed right on the table which provides a wonderful light show in the dark restaurant. 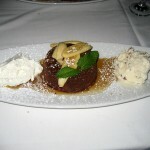 They took the traditional banana foster recipe and kicked it up a notch by adding a delicious butter cake to it. The cake is hearty and dense, but will make your salivate before each bite. The butter pecan ice cream complements the banana and cake extremely well. 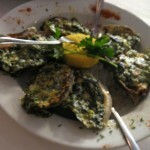 We dined at Eddie V’s on a busy Saturday evening. The tables fill up quickly, so we recommend making reservations. When we arrived, we were promptly taken to our table and our waiter immediately came to introduce himself and take our drink orders. One can tell that Eddie V’s takes pride in their service, because throughout the night the waiter addressed the reservation holder by name. As we dined, the candle on our table dwindled but it was quickly replaced. 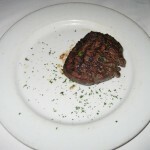 Also, when we did have a problem with our filet mignon, it was rectified without issue. The service was friendly, professional, and a definitely notch above its competitors. Eddie V’s is located in the heart of downtown near a number hotels and a block from 6th street. 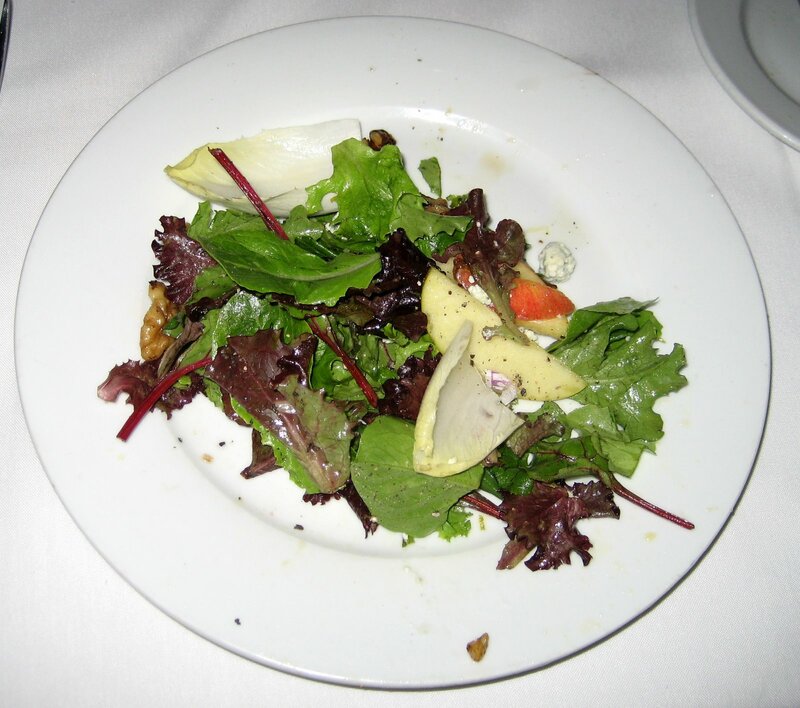 It is exactly what you would expect from a downtown steakhouse – upscale and classy. The restaurant has a bar/lounge and a main dining area. The main dining area has a mixture of rich leather booths, white linen tables, and private/semi-private rooms. The restaurant is one of the most dimly lit ones we have been to in Austin. It was so dim that the waiters use flashlights they bring the food to your table! The ambiance is definitely romantic, but also has a men’s club feel to it. This may be intentional to attract a wide audience of diners. In the lounge area, you can enjoy dinner while listening to live music or have a drink at the large bar. We’re adding Eddie V’s to our favorites list, and plan to visit the Arboretum location soon!